Dani Pedrosa is eager to check the strength in his damaged left shoulder as he prepares for the physical challenge posed by the tight and twisty Estoril circuit in Portugal this weekend. Pedrosa has yet to race since he broke his left collarbone in a practice crash for the Japanese Grand Prix earlier this month. The 25-year-old bravely tried to return to action in the recent Australian Grand Prix at Phillip Island but withdrew after qualifying with the shoulder still far too weak to cope with a full race distance. 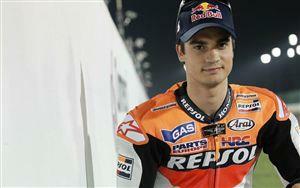 But the Repsol Honda rider believes he will be much stronger going into this weekend’s penultimate round at Estoril. Pedrosa said: “We get back on track this weekend at Estoril and, in principle, the situation should be much better than it was for me in Australia. "The Estoril circuit is not as demanding as Phillip Island and this should help me to feel more comfortable on the bike. Plus I’ve had some more time to recover, which should help too. "This kind of injury needs time to heal and with two more weeks having passed I’m really looking forward to seeing how much the shoulder has improved. I went to visit the doctor last Tuesday to have the stitches removed, and the scar is fine. "I’ve been doing some more rehabilitation on the muscles and I have some more strength, but I will not be able to fully judge how much difference there is until I get on the bike on Friday morning. "Also, I think it can be positive for me that there will be two practice sessions on Friday again, as we had in Aragon. Estoril has more right hand corners than left and that can be good for us."